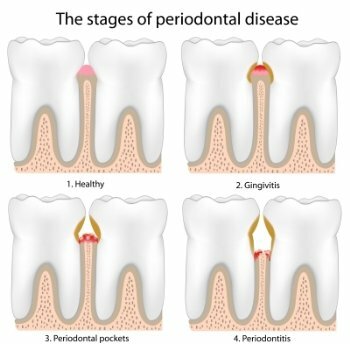 Periodontal disease can affect your gums and the bones that support your	teeth. This is not a sudden occurrence, but it may feel like it when you	find that your mouth feels swollen, red, and painful. When you find that	you are suffering from these types of symptoms, it is important to see your	Bel Air dentist immediately. The sooner you have your gum disease diagnosed, the easier	it is to treat. Diagnosis: During your examination, our dentist will use a special tool called a	periodontal probe to measure the space between your teeth and gums. If	this pocket of space is larger, this may be an indication of gum disease. If we determine that you are in need of treatment, we will move forward	with our treatment. Treatment: Our recommended treatment method will depend on the severity of the disease,	which is determined during a thorough inspection. We will likely suggest	a special periodontal cleaning in order to remove tartar and plaque from	your mouth, and smooth out all of the rough spots on your teeth. Maintenance: After your periodontal treatment is complete, we will likely recommend	that you come in for maintenance periodontal cleanings a few times a year. In these check-ups, we will thoroughly inspect your mouth for any signs	of whether the disease has returned to your mouth over time. Have you been experiencing any of the symptoms of disease, including discomfort,	receding gums, loosened teeth, and persistent bad breath? If so, it is	time to see our Bel Air dentist, who is an expert in diagnosing and treating	periodontal disease. Please don’t hesitate to make an appointment by	calling us now at 410-877-3000	!